No C flares occurred during the past 24 hours. In the next 48 hours, Cflares are possible, especially from beta regions NOAA AR 2187 and2188.Over the last 24 hours, solar wind speed observed by ACE hasfluctuated between about 340 and 430 km/s. The magnitude of theInterplanetary Magnetic Field (IMF) first varied between 3 and 9 nT, andincreased further to 13 nT from around 4h UT on October 14.Over the past 24 hours, geomagnetic conditions were quiet (K Dourbesbetween 1 and 3; NOAA Kp between 1 and 3). Quiet geomagnetic levels (KDourbes < 4) are expected on October 14, 15 and 16, with a chance foractive levels (K Dourbes = 4). This entry was posted in Sun online and tagged C flares, Sun on October 14, 2014 by Kristina. What’s that dot on the Sun? If you look closely, it is almost perfectly round. The dot is the result of an unusual type of solar eclipse that occurred in 2006. Usually it is the Earth’s Moon that eclipses the Sun. This time, the planet Mercury took a turn. Like the approach to New Moon before a solar eclipse, the phase of Mercury became a continually thinner crescent as the planet progressed toward an alignment with the Sun. Eventually the phase of Mercury dropped to zero and the dark spot of Mercury crossed our parent star. The situation could technically be labeled a Mercurian annular eclipse with an extraordinarily large ring of fire. From above the cratered planes of the night side of Mercury, the Earth appeared in its fullest phase. Hours later, as Mercury continued in its orbit, a slight crescent phase appeared again. 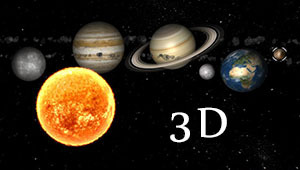 The next Mercurian solar eclipse will occur in 2016. This entry was posted in 2014, Astronomy Picture of the Day and tagged Mercury, Sun on August 24, 2014 by mari. Many think it is just a myth. Others think it is true but its cause isn’t known. Adventurers pride themselves on having seen it. It’s a green flash from the Sun. The truth is the green flash does exist and its cause is well understood. Just as the setting Sun disappears completely from view, a last glimmer appears startlingly green. The effect is typically visible only from locations with a low, distant horizon, and lasts just a few seconds. Agreen flash is also visible for a rising Sun, but takes better timing to spot. A dramatic green flash, as well as an even more rare red flash, was caught in the above photograph recently observed during a sunset visible from the Observatorio del Roque de Los Muchachos in the Canary Islands, Spain. The Sun itself does not turn partly green or red — the effect is caused by layers of the Earth’s atmosphere acting like a prism. This entry was posted in 2014, Astronomy Picture of the Day and tagged Sun on June 4, 2014 by mari. Today is the equinox. 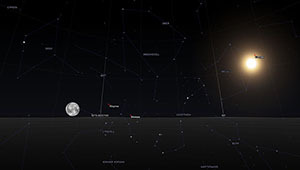 The Sun crosses the celestial equator heading north at 16:57 UT, marking the northern hemisphere’s first day of spring. To celebrate, consider this remarkable image following the Sun’s yearly trek through planet Earth’s sky, the first analemmas exposed every day through the technique of solargraphy. In fact, three analemma curves were captured using a cylindrical pinhole camera by daily making three, separate, one minute long exposures for a year, from March 1, 2013 to March 1, 2014, on a single piece of black and white photographic paper. The well-planned daily exposures began at 10:30, 12:00, and 13:30, CET from a balcony looking south from the Kozanów district in Wrocław, Poland. That year’s two equinoxes on March 20 and September 22 correspond to the mid-points, not the cross-over points, along the figure-8 shaped curves. Apparent gaps in the curves are due to cloudy days. Two solid lines at the lower left were both caused by a timer switch failure that left the pinhole shutter open. This entry was posted in 2014, Astronomy Picture of the Day and tagged Analemma, solargraphy, Sun on March 20, 2014 by mari. When does the line between day and night become vertical? Tomorrow. Tomorrow is an equinox on planet Earth, a time of year when day and night are most nearly equal. 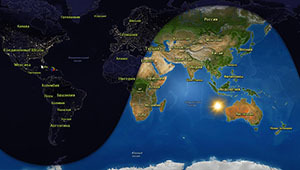 At an equinox, the Earth’s terminator — the dividing line between day and night — becomes vertical and connects the north and south poles. The above time-lapse video demonstrates this by displaying an entire year on planet Earth in twelve seconds. From geosynchronous orbit, the Meteosat satellite recorded these infrared images of the Earth every day at the same local time. The video started at the September 2010 equinox with the terminator line being vertical. As the Earth revolved around the Sun, the terminator was seen to tilt in a way that provides less daily sunlight to the northern hemisphere, causing winter in the north. As the year progressed, the March 2011 equinox arrived halfway through the video, followed by the terminator tilting the other way, causing winter in the southern hemisphere — and summer in the north. The captured year ends again with the September equinox, concluding another of billions of trips the Earth has taken — and will take — around the Sun. This entry was posted in About the project and tagged equinox, Sun on March 19, 2014 by mari.